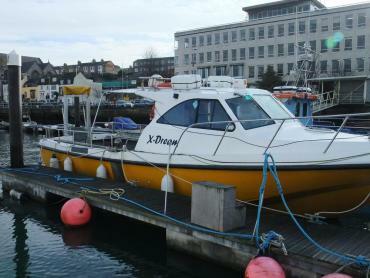 The Old Harbour Dive Centre runs an off-shore boat charter service, using X-Dream a 38ft Evolution purpose built dive boat. She’s coded by the Maritime Coastal Agency for category two in the both the brown code (work boat) and yellow code (commercial passenger code). The MCA Certificate carried by this vessel is your assurance that both vessel and skippers meet and comply with the stringent regulations imposed by the Maritime Coastal Agency, in accordance with the Code of Practice and the R.Y.A. 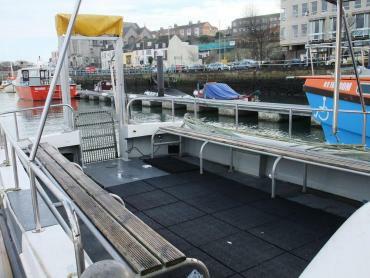 Moored in the Council Marina in Weymouth (upstream of the town lifting bridge), access is via the North Quay pontoon. There is a loading area for vehicles to drop off and collect diving equipment, and trolleys are available inside the marina for easy transportation of equipment. Access to the marina is via a gate operated with a security key and passengers are requested not to prop open the gate, and possibly compromise security within the marina. When travelling using sat nav – the postal code for the marina is DT4 8TA. ~ Main cabin to take shelter and sit and relax. ~ Hot food and drinks are served throughout the day (lunch is also included). ~ Spacious open deck with seating each side, & space for 12 technical divers with side mounts and/or rebreathers. ~ There is a tail lift, making recovery easy and effortless. ~ The vessel is equipped with G.P.S., Radar, Sonar and marine radios, together with liferafts, lifejackets, T.P.A.’S, first aid and oxygen. With a cruising speed of 10 knots transportation to dives sites is comfortable. Includes very experienced skipper, hot meal (e.g. pie or pasty), hot drinks and snacks. Individual places are £55/head. If you are unable to fill the whole boat let us know, we will still run the trip if there are a minimum of SIX paying divers, and we may be able to fill those places for you.